You'll often need tools to cut minis out of their sprues, cut wire, strapping and anything else that comes along. You can use thin sharpening tools to refine these as they wear out. Stones usually won't be thin enough, but there are diamond dust coated sharpening tools that are. I'll write another article on sharpening your tools. Something I won't cover are a few of the excessive options, but know they are out there. If you want to buy something to cut thick chain links, it's out there, as are bolt cutters. (expensive) But, if you do need some chain link, hardware stores usually provide the appropriate tool or staff to cut your lengths in store. You'll get more force from longer handled models. Probably not required for cutting plastic, but sometimes helpful if you plan on getting into thicker metals or need a little extra power. A rubber or plastic covered handle makes working with these easier. Not quite necessary, but makes things a little easier if they open themselves back up. Smaller and thinner tips are best at getting into tight areas. Larger, heavier models will work best on tougher jobs and metal. For most work, I prefer Wire Cutters. They're strong, fine tipped (so you can get them anywhere in a sprue) and thin. (so they cut close to the bit) Higher end versions come with holes / sharpened U's to strip wire, but you don't need this. These aren't really made for cutting thick metal like pewter and lead. If you do, you may notice that you'll end up with grooves in your blades. - Look at electronic stores for the best types. 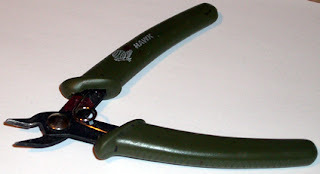 Side Cutters are a heavier duty version of cutter. They come in various sizes, but usually not as thin or fine as wire cutters so you'll have problems using them on sprues. However, they'll cut stronger materials like pewter and lead without wearing out and are great for doing a lot of modding. - Look at hardware stores for the larger stronger ones, but hobby/craft stores may have smaller versions. 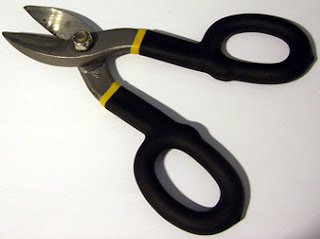 For larger, specific jobs, Tin Snips get it done. These are for cutting (thin) sheet metals, strapping and thick wire, without wearing out. Great if you plan on doing a lot of sturdy terrain work or don't want to wear your other cutters out on thick wire. The photo is my pair, just a nice small handy one. But they do come larger which also makes the cutting easier on you. (shorter handles mean you need to use a lot more force when cutting thicker metals) Also be sure to cut as far back on the blades as you can, rather than use the tips. - Hardware stores are also the best places to find these, as they also carry the products you might want to build with. 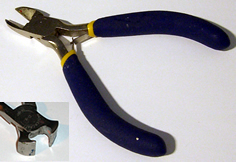 Some hobby stores carry thin sheet metals like copper and brass, and might have the appropriate cutter as well. 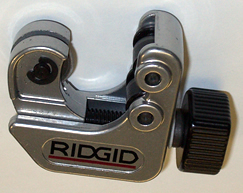 If you want to do some larger work with pipes, you'll need this Pipe Cutter to make clean cuts. Aluminum, copper and brass can make small barrels, smoke stacks, and great supporting structure for a large terrain piece. Simply place the pipe inside it, and tighten until you're cutting into the pipe some. Spin it around the pipe, tighten some more and repeat until you've cut through. - Hardware stores will have a selection of options. - Plumbing supply stores should also carry what you need, and require less hunting.